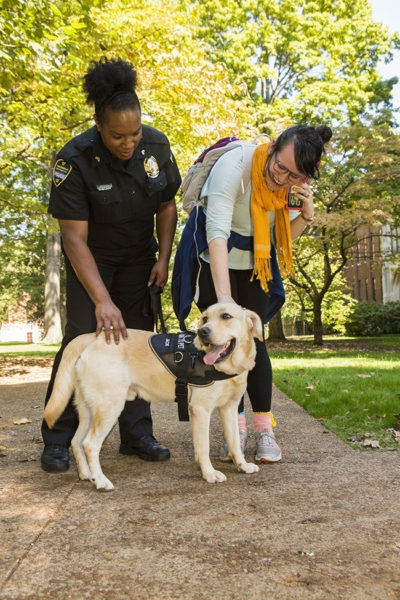 Vanderbilt University Police Department welcomed its newest member, Jack, a 2-year-old yellow Labrador retriever and the university’s first community K-9 officer, this fall. Jack serves as patrol partner to Cpl. Shaneithia Lewis, a member of VUPD since 2014 and the first woman to join the K-9 department. Different from other K-9 officers, Jack is encouraged to interact with members of the community while on duty. Faculty, staff and students are welcome to pet, play and communicate with him. The team will be a resource to the Vanderbilt community and aid in creating positive encounters with law enforcement across campus. 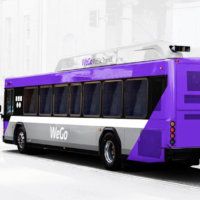 They will provide assistance in outreach efforts as well as emotional care during potentially stressful situations, such as when responding to a personal crisis. The campus community also can request that Lewis and Jack make appearances where additional sensitivity and support may be needed, such as at the Susan Gray School, within residential colleges during finals week, at Project Safe events and more. In September 2018, Lewis and Jack attended and completed “Paws and Stripes College,” a companion/therapy dog training program through the Brevard County, Florida Sheriff’s Office. 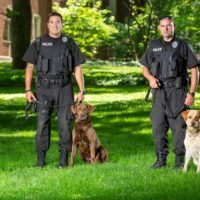 The program finds shelter or rescue dogs and pairs them with county jail inmates who are tasked with training the dogs on advanced obedience skills under the supervision and direction of a professional K-9 trainer. Lewis and Jack will participate in regular obedience training and continue to sharpen their skills as a handler and a good “canine citizen,” respectively.